EDITOR INFORMATION: George R. R. Martin is an author, screenwriter and editor of fantasy, science fiction and horror, and is best known for the New York Times bestselling A Song of Ice and Fire series that begins with “A Game of Thrones”. Gardner Dozois is an acclaimed science fiction and fantasy editor and novelist who has won fifteen Hugo Awards for his editorial work. Every story in “Warriors” appears here for the first time. Included are a new Dunk & Egg novella from the world of George R. R. Martin’s A Song of Ice & Fire, a new tale of Lord John by Diana Gabaldon, an Emberverse story by S.M. Stirling, a Forever Peace story by Joe Haldeman, and an epic tale of humanity at bay by David Weber. Also present are original tales by David Ball, Peter S. Beagle, Lawrence Block, Gardner Dozois, Robin Hobb, Cecelia Holland, Joe R. Lansdale, David Morrell, Naomi Novik, James Rollins, Steven Saylor, Robert Silverberg, Carrie Vaughn, Howard Waldrop, and Tad Williams. FORMAT/INFO: “Warriors” is 736 pages long divided over twenty short stories and an Introduction by George R. R. Martin. Each short story is preceded by biographical information about the author and a short description of their contribution to the anthology. 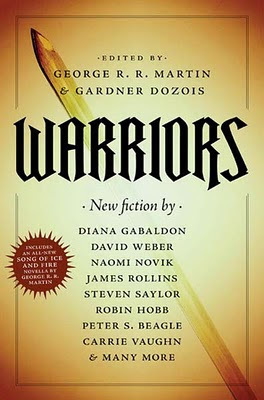 March 16, 2010 marks the North American Hardcover publication of “Warriors” via Tor. 2) “Forever Bound” by Joe Haldeman. I haven’t read Forever Peace (1998)—Joe Haldeman’s Hugo, Nebula and John W. Campbell award-winning science fiction novel—but I believe “Forever Bound” is like a prequel to that book since it features the first-person narrative of Julian Class (the protagonist of Forever Peace), while also covering such concepts as soldierboys (heavily armored robots telepathically operated by ‘mechanics’), cybernetic cranial implants (jacks) and platoon relationships (ten soldiers operating as a single group mind) found in the novel. What I do know for sure though is this: “Forever Bound” is superbly written, thought-provoking, and moving. Definitely one of the better entries in “Warriors”. 5) “And Ministers of Grace” by Tad Williams. Some of the ideas in “And Ministers of Grace” are familiar like colonized planets, implants that transmit messages/advertisements directly to a person’s brain, a “nanobiote”-enhanced soldier who reminded me some of Alex Mercer from the Prototype videogame, and religious themes, but as a whole I was blown away by Tad Williams’ futuristic tale of a Covenant Guardian named Lamentation Kane sent on a mission to assassinate the Prime Minister of Archimedes, and the ensuing chaos that follows... Would love to see the short story expanded into a full-length novel or series. 8) “The Custom of the Army” by Diana Gabaldon. “The Custom of the Army” is the second Lord John story that I’ve read after “Lord John and the Succubus” found in the “Legends II” anthology. In this one, Major Lord John Grey—a recurring secondary character from Diana Gabaldon’s bestselling Outlander series and the star of his own series—finds an innocent night at an electric eel party turn into a wild and entertaining adventure involving a duel, a marriage proposal, being charged for murder, dealing with infidelity, summoned to a court-martial hearing, and participating in the Siege of Quebec... To be honest, I can’t remember much of “Lord John and the Succubus”, but I enjoyed reading “The Custom of the Army” enough that I wouldn’t mind checking out the author’s Outlander and Lord John novels. 10) “The Eagle and the Rabbit” by Steven Saylor. Like “The Triumph”, “The Eagle and the Rabbit” is a historical fiction story featuring Romans and Carthaginians. “The Eagle and the Rabbit” though is set after the destruction of Carthage, with the rest of the Carthaginian population being put to death or enslaved. In particular, this story follows a group of fugitives captured by Roman slave traders and the terrible games they are forced to participate in, specifically the temptatio: a trial that turns free men into slaves... One of the more engrossing entries in the anthology. 19) “The Scroll” by David Ball. Never having heard of David Ball, I had no expectations about the author’s contribution and was consequently blown away by “The Scroll”: a bleak, but highly entertaining tale about a French engineer named Baptiste whose life—and the lives of his fellow slaves—hang in the balance during the construction of the city Meknes, based on the whims of historical figure Moulay Ismaïl, sultan of Morocco, and a scroll prophesizing what the engineer will do next... Another favorite of mine. I'm a huge fan of David Ball. I know you are not a fan of historical fiction, but I loved Ironfire (about the siege of Malta) and Empire of Sands (about the Franco-Prussian war and the French Foreign Legion). You might want to give either a try. This is one anthology which I'm looking out for & the 2 tales which I was most excited about were The Tad Williams & James Rollins ones. Good to know, they were fantastic & as for the Tad Williams one, TW might one day write a full scale novel about the same universe & the book might or might not be called "Arjuna Rising". Read the novel, Rescue at Pine Ridge, "RaPR", a great story of black military history...the first generation of Buffalo Soldiers. The 7th Cavalry got their butts in a sling again after the Little Big Horn Massacre, fourteen years later, the day after the Wounded Knee Massacre. If it wasn't for the 9th Cavalry Buffalo Soldiers, there would of been a second massacre of the 7th Cavalry. When you get a chance, also please visit our Alpha Wolf Production website at; http://www.alphawolfprods.com and see our other productions, like Stagecoach Mary, the first Black Woman to deliver mail for Wells Fargo in Montana, in the 1890's, “spread the word”.